To begin with, Ringo Starr is the professional name of Sir Richard Starkey. Ringo was the drummer with The Beatles throughout the 1960’s of course. He is also a successful singer/songwriter/musician and the one responsible for the title of The Beatles’ first movie, ‘A Hard Day’s Night‘. 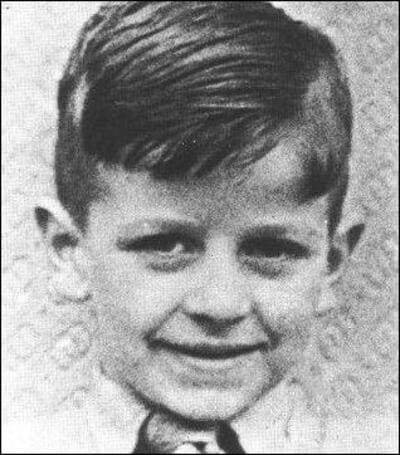 Born on the 7th July 1940, Ringo lived as an only child in a small terraced house. This was at 9 Madryn Street, in Dingle, Liverpool, England. His father was Richard Starkey and his mother was Elsie Gleave and they enjoyed dancing together. However, Ringo can barely remember his father. Once Ringo was born, his mother became a devout parent while his father lost interest in his family life. Moreover, his father spent much time off the scene and a lot of that was in the pub. In 1944, the family moved to another terraced house, 10 Admiral Grove, Dingle, Liverpool. However, soon after this his parents separated, then they divorced. Elsie had to look after Ringo on very little money and so took up some cleaning work. She then became a barmaid for 12 years as a means to get by. Elsie married Londoner, Harry Graves in 1954 and he got on well with Ringo and introduced him to other types of music including the big bands. Ringo’s school days were particularly poor. At the age of 6, after suffering illnesses including appendicitis and peritonitis, his mother allowed him to stay home and miss schooling. By the time Ringo was 8 years old he was illiterate and had trouble with basic mathematics. However, his neighbour, Marie Maguire Crawford would teach him well and he almost caught up to his peer group. 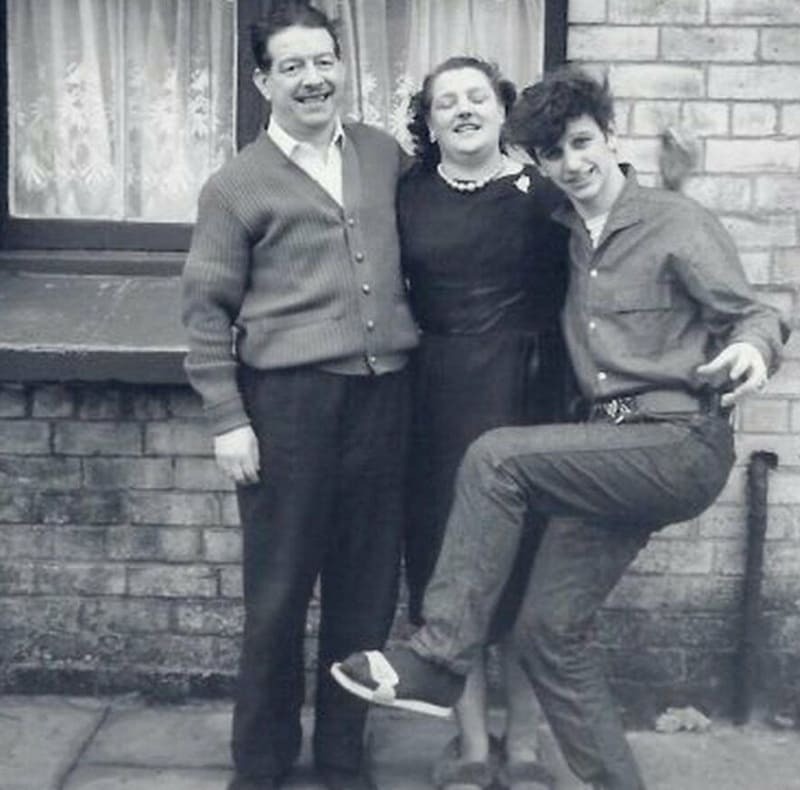 Young Ringo was to suffer another set-back in 1953. This is because he caught TB and had to reside in a sanatorium for 2 years. This could have been a pleasant twist of fate that was to give the world so much pleasure through Ringo’s talent. For it was in the sanatorium where his exposure to a percussion instrument. This was a simple cotton bobbin that became a sort of mallet that he would strike the cabinets with. Then, Marie Maguire Crawford brought Ringo a gift to help his recovery. What Marie brought in was a copy of the Alyn Ainsworth song ‘Bedtime for Drums’, and from this time Ringo became increasingly interested in drumming. Again, the extensive hospitalisation resulted in Ringo falling behind his peers again in the education system. He took up a few jobs after leaving the sanatorium in 1955, but these just allowed Ringo to survive. During his time in one job, he met mucic fan, Roy Trafford, who introduced him to skiffle. The duo began crating a few sounds on their lunchtime breaks with Roy on a guitar while Ringo created percussion sounds. Indeed, without any drums, objects such as biscuit tins and the backs of chairs would suffice. During the early days, guitarist Eddie Miles, joined in with the duo and they soon formed a band. This was The Eddie Miles Band but they soon changed that to Eddie Clayton and the Clayton Squares. They played skiffle music such as ‘Rock Island Line’ and ‘Walking Cane’. On Christmas Day 1957, his step-father, Harry Graves, got him a primitive drum kit. This consisted of a snare drum, bass drum and a makeshift cymbal. The cymbal was an old rubbish bin lid but it did the job. In fact, their makeshift equipement allowed the Eddie Clayton band to book local gigs. 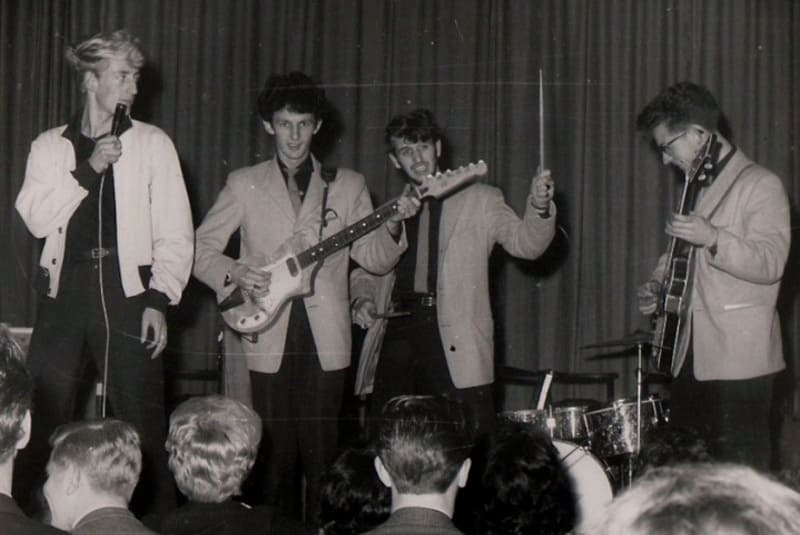 Ringo joined Al Caldwell’s Texans in November 1959, another skiffle group that were experimenting with names. They used The Raging Texans and then Jet Storm and the Raging Texans. However, their final name of Rory Storm and the Hurricanes allowed them to transform from skiffle to rock and roll which was drifting over from America. It was around this time that Richard Starkey became Ringo Starr because of the rings he wore. Not only that, but it sounded more in line with country and western, so the American influence grew even more. The Hurricanes soon became a leading band in Liverpool. Then they took up a three-month residency at a Butlins holiday camp. To do this, Ringo had to give up his machinist apprenticeship role. In fact, he only had one year to go as he served for four years and would have become fully qualified soon. So, this was another hard decision for Ringo. 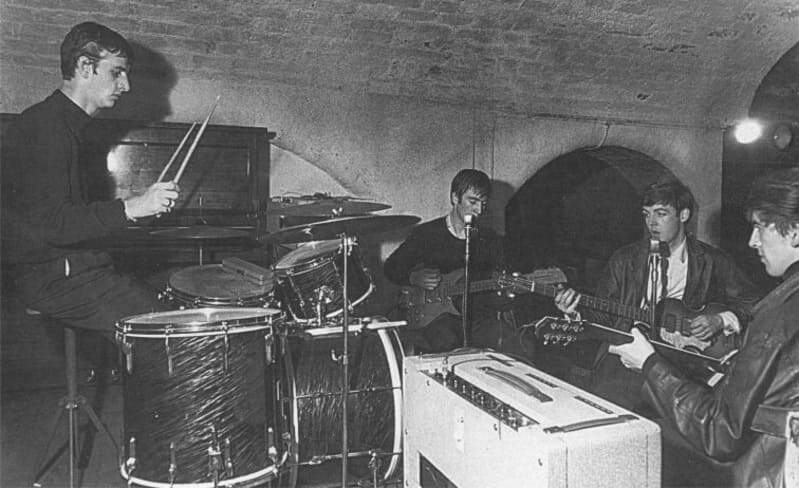 Soon, The Hurricanes were to take up residency in Hamburg where Ringo first met The Beatles at Bruno Koschmider’s Kaiserkeller on the 1st October 1960. The Hurricanes topped the bill while The Beatles also received less pay. However, Ringo would perform with The Beatles as a stand-in on some occasions. Ringo also met Tony Sheridan, who tried to persuade Ringo to leave The Hurricanes and join his band. However, this didn’t happen until January 1962. Come the 14th of August 1962, John Lennon invited Ringo to join The Beatles. By now, of course, The Beatles had a new manager, Brian Epstein. Once Ringo joined the band, Epstein sacked The Beatles’ drummer, Pete Best, on the 16th August. On the 18th August 1962, Ringo Starr appeared as the drummer with The Beatles officially. This was at a horticultural society dance in Port Sunlight on Merseyside, England. Then, the next day, fans of Pete Best began to get aggressive after Ringo played with The Beatles at the Cavern Club, Liverpool. They campaigning outside Ringo’s home and The Cavern Club itself. Indeed, George Harrison got a black eye during the protests. Moreover, Brian Epstein hired a bodyguard after protestors deflated his car tyres such was the aggravation. There was a little uncertainty when they went to record on the 4th September 1962. This is because producer George Martin replaced him with a session drummer, Andy White, on the next recording date – the 11th September. This was for the single ‘Love Me Do’ with the B-side of ‘P.S. I Love You’. Ringo obviously thought that they were going to do a ‘Pete Best’ on him. George Martin says he couldn’t take chances with Ringo because he didn’t know his capabilities. From then, Ringo Starr proved what a dynamic and competent drummer he was. Furthermore, he became a favourite amongst many fans, strengthening his position in the band. Recording from then on continued with Ringo as the drummer and the rest they say is history! The Beatles broke up in 1970 and around this time Paul McCartney and Ringo Starr fell out over release dates for Paul’s solo album. However, after all the tensions before the break up, The Beatles remained adult about things but were never in a position to reform. Indeed, all the individual members went their separate ways with their own unique styles. This was the same with Ringo Starr of course. However, in the early years of the break up, Ringo played with both George Harrison and John Lennon but not Paul McCartney. Ringo Starr released a number of successful singles in the seventies as a solo artist such as, ‘It Don’t Come Easy’, ‘Back Off Boogaloo’ and ‘Photograph’. In 1982, Ringo became the narrator for the successful children’s TV programme, Thomas The Tank Engine. In fact, Ringo has remained in the public eye and has done well for charity work too. Brian Epstein was the best man at Ringo Starr’s first wedding while his step-father Harry Graves and George Harrison were witnesses. He married Liverpudlian, Maureen Cox in 1965 but they divorced in 1975 after Ringo’s repeated infidelities. Together they had three children, Zak, Jason and Lee. Ringo also admitted to being a drunk, wife-beater and an absent father. Maureen died in 1994 from leukaemia. He married his second wife, Barbara Bach, on the 27th April 1981. Then in 1985, he became the first member of The Beatles to become a grandfather with the birth of Zak’s daughter. Ringo Starr was born into relative poverty but he managed to break through this barrier. Despite his early illnesses, lack of education and absent father, Ringo is a beacon of light to everyone in similar situations. His rise to stardom has been phenomenal but he remains down to earth. For his services to music, Ringo received a knighthood in 2018. So now, his formal title is Sir Richard Starkey. You have to give it to Ringo Starr. He had a troubled childhood didn’t he. But this story shows that anyone can get through it all if determined to do so.